Looking for a healthy, nutrient packed dinner the whole family will love? 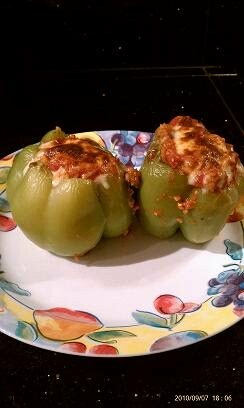 Try my Mean & Lean Stuffed Bell Peppers. They take a little prep time but they're well worth it. In one meal, your family will get lean protein from lean ground turkey, antioxidants from pasta sauce, tomatoes and bell peppers, healthy carbohydrates from organic brown rice and cancer fighting elements from garlic! 1. Begin by rinsing and hollowing out your bell peppers. Try to use bell peppers that are large and round so they can sit well in a glass baking dish. After they're hollowed out, place them in a large pot covered in water. Bring water to a boil and let the bell peppers soften in the water for approximately 15 - 20 minutes. Once they done, remove them from the water and place them in a square glass baking dish. 2. While the peppers are softening, begin making your sauce. In a saucepan, lightly heat your garlic. Add a small amount of olive oil if desired but it's not necessary. After a few minutes, pour your jar of pasta sauce. Then drain the can of stewed tomatoes and add to the sauce. This will give the store bought jar of pasta sauce a homemade taste your family will love. Feel free to add spices (oregano, basil, thyme, etc) to your liking. My husband likes a splash of Tabasco for some kick, however, your kids may not love the spicy taste so it's definitely up to you. Let the sauce thicken and simmer while you cook the turkey. 3. Place lean ground turkey in a large sauce pan and cook until golden brown. Drain and add 1/4 cup of water. Add taco seasoning and stir. Cook for a few more minutes and remove from heat Because the taco seasoning has such robust flavor, I don't feel the need to add any additional spices to my sauce. Some, however, may prefer to season their sauce as opposed to adding the taco seasoning. It's up to you. The taco seasoning is, therefore, optional. 4. For the rice, you can prepare it as it states on the package or, if you have a rice cooker, you can have it cooking as you work on the turkey and sauce. That is the best way I have found to do it since it virtually cooks itself and is never over or under cooked. 6. Now fill each of the peppers up to the rim. Pour a little more sauce on top of each pepper so that it drips slightly down the sides. Then add a dash of shredded light mozzarella cheese. Bake at 375 degrees for approximately 7-10 minutes or until cheese melts and is a golden brown. Remove from heat, let cool and serve. Enjoy!